Above the clouds (at 1600-mettre altitude) in northern Vietnam lie the picturesque and colorful ethnic villages of Sapa. Packed with beautiful nature and culture, Sapa for the last 100 years has been the ideal retreat centre for Vietnamese urban residents and international travellers alike. Sapa is situated on the magnificent Hoang Lien Son Alps, known in English as the Tonkinese Alps. To the South West of Sa Pa is Fanxipan Mountain, the “Roof of Indochina”. Muong Hoa Valley is sandwiched between the townlet and the mountain. This beautiful valley is a superb mosaic painting of terraced rice fields, familiar images in this “town of fog”. Sapa is a paradise to discover Vietnam ethnic montagnard culture. Among its 36,000 scattered population, Hmong account for 52%, Dao 25%, Tay 5%, Giay 2% and others. These ethnic minorities still retain their traditional culture, including values, customs, beliefs, arts and costumes. Sapa was originally home to H’Mong, Dao, Tay and Giay ethnic people only. Its spectacular sceneries were first discovered by the French around the 1880s. In 1891, Sapa was officially incorporated into the Vietnam colony and served as a defense gate in the northwest. Amazed by the town’s awe-inspiring nature and pleasant climate, the colonial regime quickly turned Sapa into a resort town with church, sanitariums and deluxe villas. 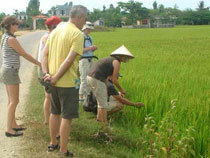 Sapa is now welcoming an influx of tourists who are allured by its magical beauty and relaxing atmosphere. From Hanoi, we followed a group of French who were impatient to discover Sapa. Arriving at Lao Cai around 6:00 am and within approximately 1 hour drive, we are now in Sapa. Still early in the morning but it's a good chance to discover the localmarket of Sapa at its vibrancy! The market stalls are filled with fruits and vegetables from the surrounding region. One can find among others: banana flowers (excellent in salads), mangoes, pomegranates, rambutan (hairy litchi) and even chestnuts. On the ground floor of the covered market are rows of crowded eateries: a series of small plastic tables and stools arranged in front of busy cooks and guests scooping the last drops in the bowl. The textile market sits on the first floor. Here we find traditional clothing made by ethnic people. The fabrics are spun, woven and dyed by H'mong women. Then they embroider wide strips and flowery images by hand. Harmoniously assembled, these materials become colorful and beautiful clothing, bags or blankets. Very often we see women embroidering stuffs in their stalls while challenging bargainers. The local market is facing many offers of low quality and cheap price from China. Along the streets of Sapa, Hmong women walk while weaving hemp. No waste of time! Most of them have their hands dyed with indigo. Sapa enjoys mountainous climate with a subtropical summer and a cold winter. Temperature pick up a bit in June-July (maximum: 29°C) and fall sharply during January-February (minimum: -0.3°C). Even snow has been seen in Sapa for some times. During summer, Sapa weather changes so frequently and quickly that you may experience different seasons within only one day. In winter, it may get foggy and chilly, especially at night and early morning. Wet season lasts from May to September, with the heaviest rain occurring in August. The best time to visit Sapa is between March and May or from October to early December. During these times, it is pleasantly sunny/ cloudy and dry, offering the very best conditions for trekking. To go to Sapa, the handiest way is to take the overnight train from Hanoi to Lao Cai and then catch a shuttle bus between Lao Cai train station to Sapa.